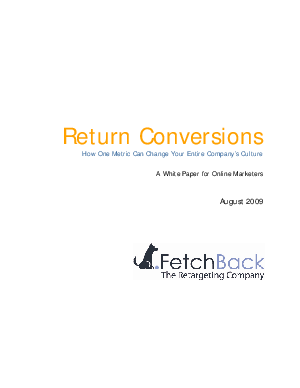 A conversion can mean something different for each marketer. A conversion can be completing an online lead form, signing up for an email list serve, or the sale of a product; it all depends on what your online goals are. For the sake of this document, we'll refer to the completion of a goal as a conversion. The majority of marketers pay attention to the statistic of their overall site conversion rate as well as the conversion rates from specific campaigns (e.g. paid search and display advertising). For example, if a website generates 100,000 unique prospects in a given month and converts 2,000 of those prospects, then the conversion rate of that site is 2%. Improvements, no matter how slight they may be, in your conversion rate have profound effects on revenue. Something widely overlooked by most marketers, but which greatly effects your conversion rate is calculating what percentage of your site conversions come from prospects who visited your site at least once before. These conversions are called Return Conversions.